В новой стратегии Bannermen вы выступаете в роли падшего лорда, который упорно пытается вновь занять своё место среди сильных мира сего. Сделайте так, чтобы только при виде одного вашего знамени, все ваши противники трепетали от страха. Вам предстоит принять участие в очень захватывающих сражениях, одержав победу в которых вы сможете стать лучшим из лучших. 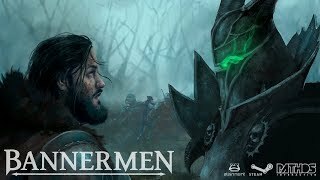 Bannermen — это игра-стратегия в реальном времени, действие которой разворачивается в выдуманном мире под названием Вальтория. Копировать содержимое папки Crack, с образа, в папку игры с заменой файлов. New unit: Vanguard (recruited in King’s Court). New unit: Ballista (recruited in Workshop). New nature power: Creep Steal. New unit spell: Chained Hook (Ballista). Fixed issue with resetting hotkey bindings. Added a note about the Hero Throne in tutorial. Improved gate behaviour in campaign mission A Jester’s Confession. Polishing tweaks in AI-behavior in campaign. Made tool-tips for Flaming Arrows and Blood Rush clearer. Knights are now recruited in Academy instead of King’s Court. Fixed issue with clicking through minmap. Fixed MMR not being updated. We now support names with special characters. Fixed crash report window from opening when exiting the game. Added emoticons to chat (write :bm: for example). All emoticons from Bannermen’s Discord except froggy is available. Added a keybinding (default Y) for chat. Reset your options before binding it. Fixed translations on tutorial map. Made Vanya contribute more to winning on the Fall of a Traitor mission. Spectating mode now shows healthbars with teamcolours as well as two resource bars. Fixed server issues that could happen when leaving and surrendering. Waiting for players, timeout was added and is 40 seconds.